To further his cause of educating African Americans about their rich, ancient past, the author published a second book. The author informs his fellow black, descendants of the biblical Ham, of their rich, ancient, biblical history. What more is there for blacks to know about their culture and history? Their biblical origins, that is. To tackle this matter, Rev. Dr. Antony O. Hobbs published “Food for the Power of Thinking, Book II: The Roots of the Races” (Dorrance; 2007). 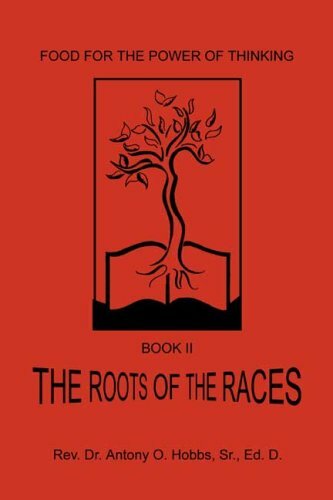 While the author’s previous book, “Food for the Power of Thinking, Book 1,” serves to drive African Americans to learn their ancient history and develop a sense of action and achievement in the present times, “Book II: The Roots of the Races” takes the readers to the past in the history of the origins of different races. Rev. Dr. Hobbs proves and contends that the first people of creation were people of color: black, brown, and other shades of complexions – but not white. Through his findings, the author traces the descendants of Ham, the father of the black race, from the Bible and determines the black nations of the Bible and their distribution worldwide. It has long pained Rev. Dr. Hobbs that African Americans know almost nothing about their rich, ancient history and that disunity is widespread in black families and communities. Such are the effects of dis-Africanization through slavery, which curse is passed down through generations. Thus, African-Americans have become the only ethnic group on earth to have a poor understanding of their own history. The author purposes to educate his fellow African Americans about their rich, ancient history, most especially their biblical origins, through his work in hopes that they reclaim their roots and their destiny. Rev. Dr. Antony O. Hobbs’ “Food for the Power of Thinking, Book II: The Roots of the Races” makes a great resource for African-American Studies. Order today through Amazon. Watch out for the public display of this thought-provoking book on African-American history at the upcoming Los Angeles Times Festival of Books on April 13-24, 2019 at the University of Southern California in Los Angeles, CA. Written by Rev. Dr. Antony O. Hobbs, Sr., Ed. D.
Published by Dorrance Publishing Co.
Rev. Dr. Antony O. Hobbs, Sr., Ed.D., was born near Marianna in Lee County, Arkansas, where he obtained his early education. He received two Bachelor of Arts degrees from AM&N College (University of Arkansas at Pine Bluff) in modern foreign languages (French and Spanish) and social studies. He also received a Masters and Ed.S. (Educational Specialist in School Administration) from Arkansas State University, Jonesboro Arkansas. Dr. Hobbs also holds a master’s degree in one of the Theological Disciplines (Ecclesiastical Studies) from Jackson Theological Seminary in North Little Rock, Arkansas. He is an ordained Elder in the African Methodist Episcopal Church. He is an avid reader and scholar of ancient world history and cultures.